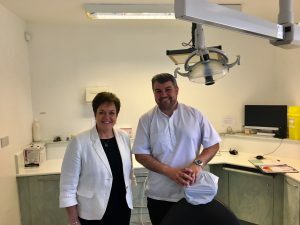 During my review of local health and care services I became very aware of the importance of focussing our dental services on improving oral health outcomes across the constituency. Contractual changes continue to evolve and I was pleased to read today’s statement by Health Minister Vaughan Gething. “It’s an exciting time to be in dentistry in Wales and I am committed to seeing dental contract reform move forward at scale and pace. Dentists, dental care professionals, health boards, and academics are working together to shape and deliver transformation in line with A Healthier Wales. We are investing in every area of dentistry; in primary and secondary care, in General and Community services. Investment designed to create better ways of working and encourage innovation and collaboration. Our Designed to Smile Programme introduced a preventive led approach care programme for children. It is delivering improved outcomes across all social groups and producing efficiency savings. We are witnessing the highest level of child access to general dental practice in the last two decades in Wales. The number of children having a general anesthetic for the removal of teeth is falling significantly. Whilst I acknowledge this improvement in child access and care, I am also aware that challenges remain for many adults. Making sure all patients who want to access dental care are able to so is our greatest challenge, particularly for those with the greatest needs who may not always use services as we intend. We now need to use what we have learnt to push forward with the wider transformation needed to deliver better and fairer outcomes. Whole system change is happening in dentistry in Wales. I am committed to pick up the pace and scale of reform by expanding the number of practices and teams taking part. Further progress and sustained effort in contract and system reform is required for equitable access and new ways of working in dentistry to become a reality and the norm in Wales. We are taking a ‘test and modify’ approach within the dental contract reform programme to ensure change is taking us in the direction we intend. Reform has to be fair for dental teams, health boards and patients. Low value Units of Dental Activity do not support quality and are being taken out of the system. The principles of fairness, co-production and collective responsibility to making change are being followed. The burden of dental disease impacts adversely on too many lives in Wales, particularly in vulnerable and disadvantaged groups. It is costly for the NHS, can be unpleasant to treat and some of our young adults are severely affected – many often attending emergency and urgent care services in pain. Access to dental care still remains variable across Wales something we need contract reform to address. Good oral health makes a contribution to wider health and well-being. We must inform and empower patients and the public to value, maintain and protect their own oral health, and that of their dependents. We want patients to understand how their choices affect their likelihood of developing dental disease. We want dental teams to personalise key messages, to deliver consistent advice and care, which will assist patients to lower their risk of oral disease. The ‘risk and need’ tool – the Assessment of Clinical Oral Risk and Needs (ACORN) – and its patient facing information which was developed in reform practices, is helping us to do this. The majority of access to NHS dental services in Wales is delivered in a primary care setting by independent contractors. We have acknowledged that the NHS dental contractual system is built around providing treatment. That is why the dental reform programme is prevention focussed, needs led and will in time be outcome measured. We are removing financial disincentive so dental teams can focus on prevention and make use of the skills of the whole team to open up access. We are securing objective and external ‘realist’ evaluation of the reform programme to build on learning and embed change that delivers our collective aims. The dental Innovation Fund is supporting clinical teams by accelerating an expansion in dental care professionals. The first call for bids resulted in offering direct investment of some £750,000 to 33 practices across all 7 health boards and a second call is planned for later this year. Fifty three dental practices across all health boards are now actively participating in dental contract reform. A further 41 practices have applied to take part in the next phase from April. This will mean well over 20% of practices in Wales will be part of the reform programme. Electronic data capture is now in place. New approaches to contracting, and more meaningful measures than Units of Dental Activity alone, are allowing practice level quality, access, risk and need to be understood. The majority of dental reform practices are demonstrating that increasing access, improving quality and preventive intervention, and expanding skill mix in teams is possible. It has confirmed the evidence to support the direction we are taking and I want to see further increases in the number of practices taking part. I am aware wider system change and innovation is also driving and underpinning change. I am pleased to hear that the dental e-referral management system has been successfully implemented in Hywel Dda and Abertawe Bro Morgannwg health boards, and is to follow in the remaining 5 health boards by June this year. Wales will be the first country in the UK to achieve electronic submission of all referrals to all dental specialties. By this time next year the source, complexity and volume of all referrals to all dental specialties will be known. This needs assessment will stimulate discussion, support evidence informed workforce planning and pave the way to service redesign – with a shift out of hospital for procedures that can, and should, be delivered by enhanced primary care models. This will offer career opportunities for primary care dentists to pick up and use additional skills. I also want to highlight the establishment of the All-Wales Faculty for Dental Care Professionals. The Faculty, based in Bangor University and funded by Welsh Government, has been established to provide a platform to enrich the training environment and the capability, well-being and engagement of Dental Care Professionals. This includes creating two skills escalators and new educational opportunities. I look forward to reporting on further progress”.